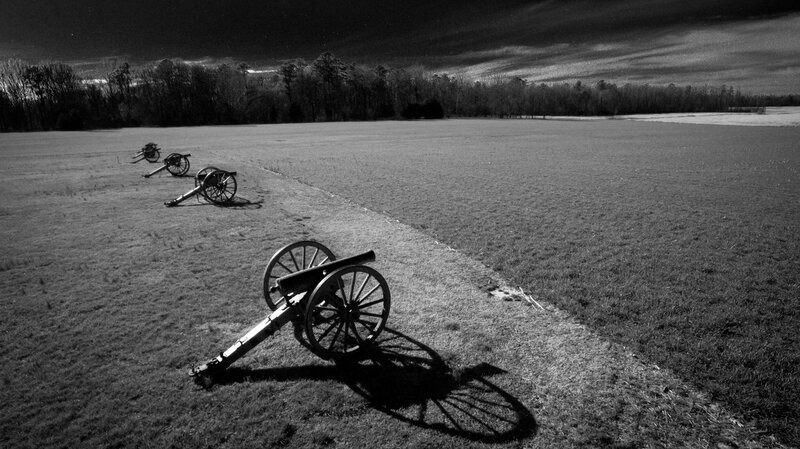 Posts with tag: "Civil War"
Living near Malvern Hill, one of the more pristine of the Civil War battlefields is an advantage to visiting frequently. My connection to Malvern Hill is that my ancestor General William Barksdale fought there and survived. It is not commercialized like many of the other battlefield sites. The Seven Days Battles were a series of six major battles over the seven days from June 25 to July 1, 1862, near Richmond, Virginia during the American Civil War. Confederate General Robert E. Lee drove the invading Union Army of the Potomac, commanded by Major General George McClellan, away from Richmond and into a retreat down the Virginia Peninsula. The series of battles is sometimes known erroneously as the Seven Days Campaign, but it was actually the culmination of the Penninsula Campaign, not a separate campaign in its own right. This year, the crop growing around the canons is wheat, last year it was milo. I made this photo with a DJI Phantom 3 Professional and gave it an infra red treatment in Lighroom. You can see the stars even though it was shot in broad daylight.